I absolutely adore The Village of Hommlet. There are a lot of reasons why this is so, but I think, more than anything, what I like most about it is that it has an ominous, brooding character to it that haunts my imagination. Unlike, say, the Keep from Keep on the Borderlands, Hommlet feels like it's a community that sits on the precipice of disaster. Though the forces of Good carried the day and defeated the forces of Elemental Evil some years previously, the victory was not total and everyone in Hommlet knows it -- even if they dare not speak the truth. The ruins of the moathouse are stirring again and agents of Elemental Evil have infiltrated the village. Everyone knows it's only a matter of time before Evil will again rear its ugly head; it's simply a question of when and whether Hommlet will emerge from the coming battle intact. I don't know; it's hard to explain. There's just something powerful about this set-up, something that, for me anyway, strikes me as the perfect set-up for a new campaign. I share with Tolkien the conception of history as a "long defeat" and The Village of Hommlet touches on that theme obliquely -- the notion that each generation must stare Evil in the face and bar the way of its advance, even if it's ultimately just a holding action, for Evil can never truly be defeated in this life. Obviously, I'm reading more into this module than is there in the text, but that's part of the point of this entry. T1 inspires in me a lot of feelings and emotions that I find incredibly useful in kicking off an old school fantasy campaign. 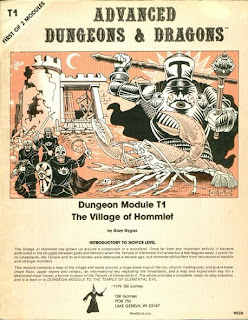 There's also the fact that, as the cover notes, The Village of Hommlet is the "first of 2 modules." T2, as originally conceived, never came out and I regret that. When we finally got The Temple of Elemental Evil, it was nothing like the module I expected it to be, nor do I think was it much like the module Gary would have written had he done so in 1979, as planned. The six year gap between T1 and its sequel gave me plenty of time to create my own conception of the Temple of Elemental Evil, which bore little resemblance to what we finally saw in 1985. The "unfinished" character of T1 is appealing to me; I see it as representing unexplored possibilities and, for me, that's the essence of old school module making. Little details like that simply tickle my fancy. Likewise, the pretty squabbles of the various villagers over past slights, the rivalry between the followers of St. Cuthbert and the Old Faith, and the loves and losses of the townsfolk are an amazing tableau against which to adventure. The whole thing is very atmospheric and I can't helped but be pulled into it. Then there's the moathouse, which has everything I crave from a low-level old school dungeon: a plausble backstory, lots of vermin, and several encounters that might, if the PCs are foolhardy, lead to deaths. To my mind, the moathouse ruins provide a superb template which other referees might use in creating their own starting dungeons. It's a great example of Gygaxian naturalism in action, which is itself a reminder that, while the campaign may be set in a fantasy world, that doesn't mean the world exists solely to fulfill the players' fantasies. There are many encounters -- such as the giant crayfish -- that will kill low-level PCs if they are stupid enough to charge in until they are ready to do so. I like that a lot and it's something that D&D has slowly lost over the years, much to my disappointment. What can I say? I absolutely adore The Village of Hommlet. I used Hommlet in conjunction with Keep on the Boarder Lands, and Hommlet was a village located near the keep. It worked very well, and when ToEE came out, I used the cave complex as a bridge to that module. I really have fond memories of these two. I couldn't agree more about your love of T1 as a separate entity from the larger ToEE schema. I've run it a half-dozen times, always with the moathouse as the climax, because, well, I didn't have a Temple and never got round to making one of my own. Hommlet also makes a terrific base of operations even after the moathouse is kaput. The Kron Hills can hold many dungeon areas, and its a quick enough jaunt to major urban areas like Verbobonc, Greyhawk, and Dyvers. I had a lot of fun with some Verboboncian politics impinging on the village as well. T1 is indeed an epic example of the type of design that defined the early years of Dungeons and Dragons. I loved the way that Gygax literally invited a DM to come on in and play in his sandbox. It, to me, was the perfect compliment to the AD&D DMG. I spent countless hours paging between the endless charts in the DMG in an effort to stock every nook and cranny in that module. I'd love the chance to use it again some day, it was such a fantastic tableau for kicking off a campaign. Hommlett err Brewersbridge plays an important part in the middle part of the Paksenarrion Trilogy by Elisabeth Moon. I still remember reading that section when she first walked into the village. I went "Damn that familiar" Then Druid near the Welcome Wench err Jolly Potboy made me go for my Hommlett map which confirmed that Brewersbridge is Hommlett with different names. They even get to go the moathouse. I am sure they also fought those damn frogs. The Paksennarion Trilogy is notorious for its thefts from D&D. Isn't the main character a worshiper of "St. Cuthbert?" Here are some reasons the ruins of the moathouse are so fantastic. "The bogs here stink, and the vegetation appears dense and prolific, but somehow sickly and unhealthy, creepers and vines throwing their strangling loops over the skeletons of dead saplings and living bushes alike. The rushes and cattails rustle and bend even when only a slight zephyr blows over the marsh, and weird bird calls, croakings, and other unwholesome sounds come faintly across the fen." One gets the sense of teeming life, which is at the same time a perversion of the natural order. This sets up beautifully the encounters with the unnaturally large creatures (serpent, crayfish, rats, tick) that have encroached on the moathouse since it was abandoned. (2) Another thing is the amazing physicality of the layout of the moathouse. From the road the players can see that the walls are crumbling in various places. If they scout around they will have to tromp through the swamp and the cattails, which of course will be a difficult mess. Given the crumbling walls, there are fives ways in, in total, two of which do not involve wading through the moat, and each of which holds a nasty surprise. Perhaps the worst but most tempting way in is through the crumbling wall of the keep, which has spilled across the moat. The bandits have a lookout posted their, and the ambush as the players crossing the stream, with arrow slits and all, will be highly unpleasant. (3) Finally, there are so many questions left unanswered that demand the DM to imagine. Most glaringly perhaps, what is the relation of the bandits on the first floor to Lareth and his people down below? Do the bandits know what's underneath the moathouse? Are they somehow in league with the cleric? As anxiously as I anticipated T2, I now almost wish T1–4 had not been published. Perhaps the temple should have always been something for individual DMs to develop rather than TSR promising a T2 at all. I would love to see some OSRIC T2s (with the proper nouns altered as necessary). Some different people’s ideas of the temple in one module as inspired by T1. I know the "supermodules" were often edited versus the original material, so I was wondering if Hommlet and moathouse presented in the T1-4 was the same as the original in T1? I believe the T1 section of T1-4 is identical to that in the original module, barring a few editorial changes here and there to correct errors, etc. When we were 13, my friend who introduced me to D&D wrote off T1 as "It's about killing farmers." My own appreciation of T1 has improved as I have improved as a DM -- and perhaps that is the truest measure of a module's greatness, that you never outgrow the material. I love the Village of Hommlet, it's my favorite module ever, and I've both played it as a character and ran it as a DM. I haven't played in 25 years, but I remember the module exacly, the names of the people, everything, like it was yesterday. I love it for all the reasons you described, plus the implied religious tension between the "old faith" (druidism) and the new religion of St. Cuthbert. My only problem with it though, and it's not really a problem just an observation, is that if you follow the advice in the beginning, and play it with brand new, proper first level characters (not super-characters with three 18's each, but not naturally-rolled characters with lots of 5's and 6's for stats either), it's impossible. It's funny, people used to mock the module as being a cakewalk, far too easy, but I don't see it. Lets say you get 5 players together. Lets say they all roll up new characters, and you have two fighters, a magic user, a thief, and a cleric...a well-balanced party. Then for good measure, you pick up a couple of the guys in the village, most of whom will betray you (Zert, Kobort, Turuko and Fernok all will rob you at best, and kill you at worst; Spugnoir deals relatively fairly but he's not exactly reliable), and then you wind up TOTALLY screwed. So, maybe a party of 7 explores the moathouse. Let's say you're smart, not a group that just goes from one encounter to the next in dumb hack and slash mode. Let's say you play it carefully. Use a stealthy thief to scout areas first. Use a cleric to turn some of the ghouls. Use Spugnoir's sleep spell to take a big chunk out of the brigands. Bribe the gnolls instead of fighting them. Stay back and use missile fire or backstabs whenever possible. Use a charm spell on someone to find out info. But no matter what, you're going to wind up in some heavy combat, and you're still first level characters. Oftentimes, one hit can kill you, and in most fights you're outnumbered. The huge spider bites you and you've got a 50% chance of missing your saving throw and DYING. If you don't successfully turn the ghouls and have to fight them, they probably have more hit points than most of your party (they're 2 HD monsters) and they each get three strikes per round, so you're very likely to get hit and get paralyzed. With the guards, even with a sleep spell or some other special tricks, it's almost statistically impossible to win. Depending on how it plays out, you'll fight between 12 and 18 guys who are essentially 1st level fighters, plus 2 sergeants, plus a FOURTH LEVEL fighter with 31 hit points and an armor class of 1. Then there's the bugbears, any one of which is more than a match one-on-one for any of your first level fighters. Throw in a dozen zombies, a tough ogre, and Lareth himself, and any one encounter could wipe out your party. And there's no healing potions to be found in the moathouse. I don't know how we ever got through this without divine intervention. So again, it's not a criticism because I LOVE this module, and it gives players lots of space for roleplay and creative problem solving, but I'm just saying that it's one of the most difficult modules ever, relative to the level of the characters. Yeah, Queen of the Demonweb Pits was super hard too, but at that level you've got tons of resources and options you can turn to. Of course, you can always bring Elmo with you, but he's so powerful he'd do most of the work for you, so what's the point? I think, for 4 or 5 second and third level characters, this is a challenging module.